Sharon Moon is a gifted Intuitive, Tarot Master, and Psychic. Her connection and abilities begin with her spiritual alliance working with Angels and Master Guides. She is able to work with you on any subject matter. She empowers your confidence and encourages you to advance in all areas of your life including: Spirituality, Love, Family, Career, Employment, Talents, Health and Healing, Life Purpose, Life Contracts, Past Lives, Education, Understanding Grief and Loss, and etc. Sharon is known for accuracy and honesty in all readings. With over forty years of professional psychic experience, she has many insights to offer the most spiritually evolved individuals and the newcomers alike. Her genuine and intuitive sensing skills enables her to help you to propel forward when making decisions, difficult or otherwise. She enlightens and reveals the path options in front of each individual and encourages you to make the decision that will most likely lead you to success. Truth and integrity is her standard. Her compassion, wisdom, and guidance facilitates alignment with each individual’s authentic self. Sharon is a clairvoyant, clairaudient, and clairsentient. Even though Tarot is her chosen modality, the information still flows on all aspects of her psychic channel. She believes there are always answers and many times, there are more than one option or solution to any given question. Sharon helps to expose your path options and encourages you to take the one that is most beneficial to you – your growth – and your ultimate happiness. She believes your life is your own unique script in which you should be the author. 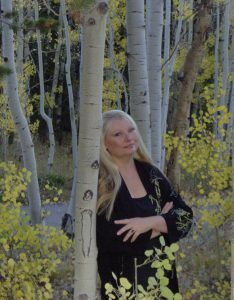 Sharon’s studies and practices Earth Magick, Native American Rituals, and Celtic Wicca. She believes that anything is possible. Directing energy with proper focus, purity of heart, prayer, and absolute concentration will make positive changes happen for those who desire growth and change. She offers classes in both Tarot and Wicca for those who seek to learn. Sharon (Sister Moon) is a psychic on the nationally acclaimed Shay Parker’s Best American Psychics.